This artists’s concept gives an impression of how common planets are around the stars in the Milky Way. A six-year search that surveyed millions of stars using the microlensing technique concluded that planets around stars are the rule rather than the exception. Alien planets are incredibly common in our Milky Way galaxy, outnumbering stars by a large margin, a new study suggests. On average, each of the 100 billion or so stars in our galaxy hosts at least 1.6 planets, according to the study, bringing the number of likely alien worlds to more than 160 billion. And large numbers of these exoplanets are likely to be small and rocky — roughly Earth-like — since low-mass planets appear to be much more abundant than large ones. "This statistical study tells us that planets around stars are the rule, rather than the exception," said study lead author Arnaud Cassan of the Paris Institute of Astrophysics. "From now on, we should see our galaxy populated not only with billions of bright stars, but imagine them surrounded by as many hidden extrasolar worlds." To date, astronomers have discovered more than 700 planets beyond our own solar system, with 2,300 additional "candidates" found by NASA's Kepler space telescope awaiting confirmation. Kepler employs the transit method, which watches for the tiny, telltale dips in a star's brightness caused when a planet crosses the star's face, blocking some of its light. Radial velocity looks for minuscule wobbles in a star's movement caused by the gravitational tugs of orbiting planets. While these two methods have been highly productive, they're biased toward finding planets that orbit relatively close to their parent stars. In the new study, Cassan and his colleagues employed a different technique, known as gravitational microlensing, that feels this bias less strongly. In gravitational microlensing, scientists watch what happens when a massive object passes in front of a star from our perspective on Earth. The nearby object's gravitational field bends and magnifies the light from the distant star, acting like a lens. This produces a light curve — a brightening and fading of the faraway star's light over time — whose characteristics tell astronomers a lot about the foreground object. In many cases, this nearby body is a star. If it has any planets, even ones in relatively far-flung orbits, these can generate secondary light curves, alerting researchers to their presence. The Milky Way above the dome of the Danish 1.54-metre telescope at the European Southern Observatory's La Silla Observatory in Chile. This telescope was a major contributor to the PLANET project to search for exoplanets using microlensing. In the new study, the researchers looked at data gathered by a variety of Earth-based telescopes, which scanned millions of stars from 2002 to 2007 for microlensing events. Considering how perfectly aligned multiple bodies must be to yield an explanet detection via microlensing, that's a pretty impressive haul, researchers said. 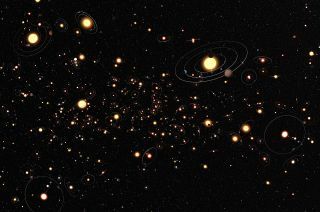 The astronomers used all of this data, as well as information about seven additional planets detected by other microlensing efforts, to put a number on their planet-detection efficiency — and, by extension, the number of alien worlds that may populate the Milky Way. "Moreover, we confirm that low-mass planets, such as super-Earths (up to 10 Earths) and Neptune-like planets are much more abundant than giant planets such as Saturn and Jupiter (with estimates that there are 6 to 7 times more low-mass than giant planets)," Cassan told SPACE.com in an email. Further, according to the researchers' calculations, every star in the Milky Way harbors an average of 1.6 planets in the 0.5-10 AU range, which in our solar system corresponds roughly to the swath of space between Venus and Saturn. Since astronomers estimate that our galaxy contains about 100 billion stars, that works out to at least 160 billion alien planets. A fair number of these alien worlds are likely to have two sunsets like the planet Tatooine in the "Star Wars" films; a separate study, also announced today, related the discovery of two exoplanets that orbit a pair of suns. Cassan and his team report their results in the Jan. 12 issue of the journal Nature. The true number of alien worlds may be quite a bit larger than 160 billion. Some planets hug their host stars more closely than 0.5 AU, after all, and others are more far-flung than 10 AU. And a great many likely have no host star at all. Last year, a different team used microlensing observations to discover a huge population of Jupiter-like planets that zoom through space unbound to a parent star. These free-flying "rogues" likely outnumber "normal" alien worlds with obvious parent stars by at least 50 percent, according to the 2011 study. "The two results obtained by microlensing show that planets are everywhere, and not only around stars," Cassan said. "We used to think that the Earth might be unique in our galaxy," study co-author Daniel Kubas, also of the Paris Institute of Astrophysics, said in a statement. "But now it seems that there are literally billions of planets with masses similar to Earth orbiting stars in the Milky Way."